Voices: Jean-Claude Donda, Eilidh Rankin, Duncan MacNeil, Tom Urie. A few years ago there was “Paris, Je T’aime” and more recently “New York, I love you”, both films celebrating the culture and essence of these great cities. With this follow-up to his animated film “Belleville Rendez-vous”, French director Sylvain Chomet, could easily re-title this…”Edinburgh, Je T’aime”. It is a painstakingly hand-drawn animation of Scotland’s capital city (where Chomet now lives) and so vast in it’s detail that only someone who knows and loves the city could capture. 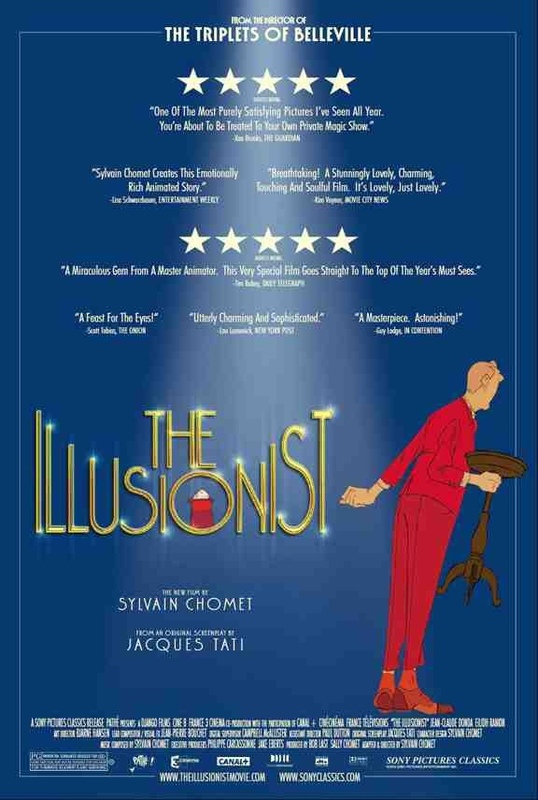 Based on an incomplete script by French comedian Jacques Tati, it tells the story of ‘The Great Tatischeff’, an illusionist who is scraping up a living by doing his magic tricks in the old music halls of France and England. His profession is not in demand anymore and he eventually travels to the Scottish islands for another rare paid job, where he meets a girl called Alice. She is amazed by his abilities and follows him to Edinburgh where they explore the wonders of the city together. It’s such a treat to get hand-drawn animation these days and with “The Secret of Kells” also released, we have been treated to two fantastic animations in one year. However, on both occasions the stories have not been up to scratch. “The Illusionist” only lasts for approx 1hr 25mins but as it’s mainly dialogue free, it seems a lot longer. 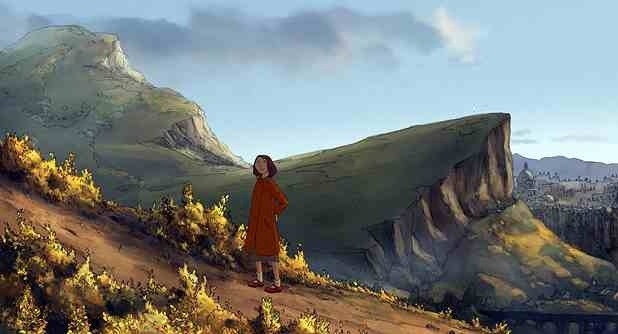 Don’t get me wrong, the animation is absolutely beautiful and the city of Edinburgh is hand painted to perfection that you could say that, the city itself, is the main character in this story but it’s hard to maintain your interest for the entire length of the film when there’s not a lot happening. Visuals can only work so long and it also doesn’t fully explain the motivation behind the two main characters. We are left as bewildered and meandering as them, with their French and Scots Gaelic language barriers. It’s a real shame, as I’d really like to give this film top marks but the narrative let’s it down. The hand-drawn animation is something to behold though, and it definitely deserves top marks in that department. Chomet has delivered a deeply melancholy little film about the demise of vaudevillian entertaiment, in visually splendid style. Unfortunately, it lacks a narrative drive but like the protaganist in his profession, it has a few things up it’s sleeve. This entry was posted on January 28, 2012 at 2:41 pm and is filed under Animation, Comedy, Drama with tags 2010. You can follow any responses to this entry through the RSS 2.0 feed. You can leave a response, or trackback from your own site.